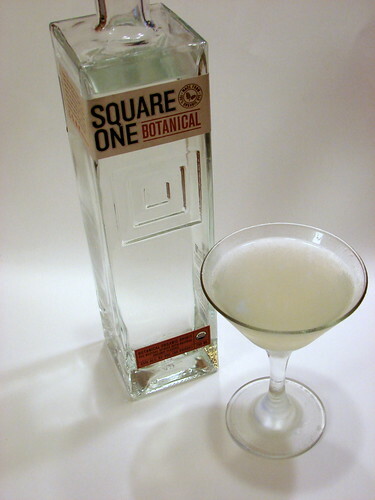 Tonight at Thursday Drink Night, in the Mixo chat room, we’re hosting Allison Evanow, founder of Square One, and bartender H. Joseph Ehrmann, to discuss Botanical, the latest offering from Square One. Here’s a great recipe that uses this spirit. Combine all ingredients in a shaker with cracked ice. Shake well and strain into a cocktail glass. Add garnish. I’m looking forward to this tonight! Got a recipe idea (and more importantly drink name) mostly worked out. (Disclaimer: Square One is allowing me to comment here as such above and participate tonight due to sending me a sample as well). This is a play on the corpse reviver #2, isn’t it? Very interesting. I will have to look forward to seeing this new spirit on the shelf at the liquor store. Sounds like a lovely drink, but I’m a sucker for anything with Lillet. Have you tried the cucumber version yet? Really nice with Domaine de Canton and a touch of lemon.